Amy's Creative Pursuits: Penny Black "Shape Up!" I've been seeing these round cards all over the place lately, so when the Penny Black Allsorts Challenge Blog came up with the idea to challenge us to create a 'shaped card', I thought, 'Now's my time to create my very first round card!'. I used a sketch by Mojo Monday and the paper is Cosmo Cricket. It was a lot of fun creating a round card. I don't know if I'll do it too often, but it was a good change. I still haven't been able to leave comments on your blogs as of yesterday. I did email blogger and told them I was still having problems. So if your wondering why I haven't been visiting you recently, that's why. I can't leave comments. It's very frustrating to me. I expected the issue to be resolved in 24 hours, and it's been going on for over 3 days now. UGH! this is so cute amy - i love pb and your round base! Gorgeous Amy! Love the circle card and your fabulous colour choices! I too have trouble posting, but only with the blogs who don't have this "pop up" window. The blogs with it in line just send me in circles...argggg! Your header with the flowers and butterfly is BEAUTIFUL!!! I'm a new follower. this is sooooo adorable, I luv making circle cards, my favorite shaped card....have a fabby weekend! Blogger really is being a bother these days. I think it is fixed now. This is a great shaped card. 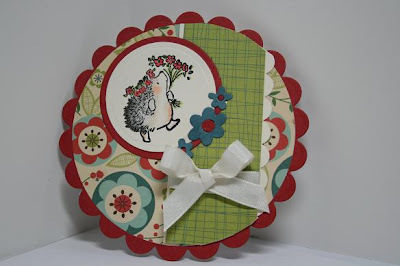 I love these sweet stamps..
What a sweet card Amy, love the papers and the cute hedgie. Blogger seems to be troublesome for many of us, I can leave comments, but the updates aren't working properly. Hope they'll solve the issues soon. Lovely and cute card, Amy! Nice to see you with us again Amy. Another gorgous card from you as usual. I love the colour combo and layout. The shape is perfect for our challenge this month at Penny Black at Allsorts. Thank you for joining our challenge this month and good luck in the draw.